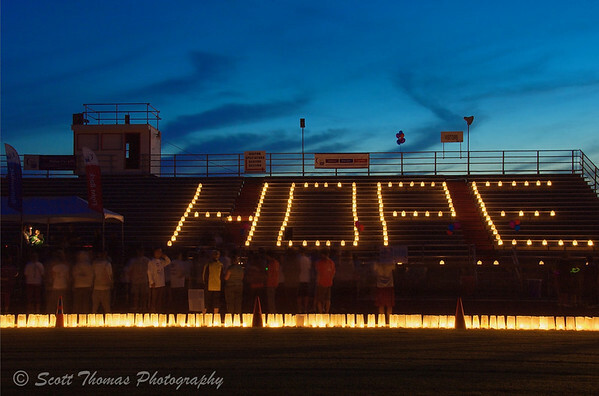 A Cancer Survivor addresses the participants, volunteers and guests during the 2009 Baldwinsville Relay for Life fund raiser for the American Cancer Society as the word HOPE is illuminated in the bleachers of the Pelcher-Arcaro Stadium on the campus of the C. W. Baker High School in Baldwinsville, New York. Luminaries line the inside of the track. Each dedicated to friends, family and loved ones who have lost, are still fighting or have survived their battle with cancer. Ten months ago I lost my sister, Linda Drew, to brain cancer only two months after I took this photo. Earlier in 2009, my nephew died of stomach cancer and, just last month, my Father-In-Law passed away from complications of bladder and liver cancer. To say its been a tough year on my family is not saying enough. We can not bring our loved ones back but we can try and help those who are suffering now and into the future. In a few days, my family and I will be participating in the 2010 Relay for Life on June 18. We named our team, Drew’s Crew, for my sister, her husband (who died of leukemia) and her son (my nephew). It is our hope, in some small way, our contributions will help in developing new treatments against cancer which may lead to a cure. We are close to our goal. If you would like to help, click the link below. Thank you for your past and future support! This entry was posted in Event, People and tagged american cancer society, baldwinsville, blue, cancer, dusk, hope, light, luminary, new york, relay for life, sky. Bookmark the permalink. Oh, Scott. I had no idea that cancer has tragically touched your life so many times. I cannot even imagine that sort of loss. I wish I had something beautiful and eloquent to say, but I am at a loss. The photo is lovely and so is the messsage. You and your family are truly inspirational! My family is also too familiar with the ugly cancer monster. My Relay event is this coming weekend (June 12th). I love the luminaria ceremony. Our team is known as Pink Jell-o Posse…team name chosen in honor of our beloved mother. Looks like the clouds were trying to spell out something as well. I wish you success with your event! Yesterday I took a friend to her biopsy appointment; her doctor is fairly sure she has breast cancer. Today my beloved brother-outlaw Franklin will have his 26th radiation treatment. Bonnie-Beloved-of-Bob is recovering well from her treatments. We hope on. My condolences on your terrible losses. My thanks for your determination to hope. Hope is a beautiful thing. I lost my dad to leukemia in 1992, and Greg’s brother lost his battle with kidney cancer, that had spread to several other organs, in 1999. Sometimes it’s all too much, isn’t it. And then we gather our resources and march on to make a difference. So that losing them wasn’t just a waste. Which of course it was. But they give you such strength, don’t they? Because they’ll be right there with you, as will all of us; those you know personally and those you will never meet. Our best to you. My mom who was terminally ill with cancer almost 7 years ago is now filling out forms to compile a list of relatives who have died of cancer for her local health unit. It is disheartening to encounter it so many times in one’s family. Yet, cancer is no longer the death sentence it once was and changes to diet and lifestyle can work wonders. So can prayer. All the best of health to you and your family Scott. My thoughts are with you and your family Scott. HOPE is what drives people through painful treatments and fearful imaginations. So sorry to learn that you’ve lost so many loved ones to cancer, I lost my mom to liver cancer also, and at the time all we had was HOPE. I’m sorry for your losses, Scott. Some of the new developments in the fight against cancer seem to be pretty positive now and that trend should continue. I’m so sorry to read about all the losses in your family and all the pain it has given to you relatives. Here I give you a big hug – it’s only digital – but I hope it might help you just a little bit…. I remember this photo from last year, when you wrote about your sister. Since then you have had yet another loss, I am so sorry to hear about this. It has been a hard year for your family. The tradition with candles are beautiful and very touching. You Americans are so good at making arrangement like this, and become strong together. It is difficult to comment without repeating what has already been so eloquently said. Best wishes for your event and for survivors and for your family. I want to thank each and every one of you. It’s funny, I have not meet any of you in person and yet you still feel like family. I know Kathy has written we still only know a fraction of each other’s life. It still feels a whole lot more to me. We live on as those who have left us would want us to do but we will never forget them. Bless you.